Something as simple as a hot cup of herbal tea can give you the calm you crave when feeling under the weather. Between feeling bone tired, stuffed up, achy and having a chest-rattling cough, you can’t wait for the symptoms to go away so you can get on with your life. There are plenty of herbal teas that taste delicious and can help loosen the hold symptoms from a cold or flu infection have on you. The aromatherapy from inhaling steaming herbs soothes irritated sinuses and lungs. The warm liquid encourages a sore throat to relax. And the properties the hot water extracts from the herbs help support your immune system, calm an upset stomach and break up congestion in your nose and chest. 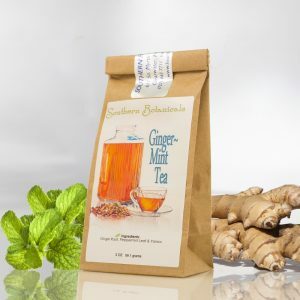 1) Ginger Tea – A cup of tea made with ginger has a wonderful warming effect on your body that feels very comforting if you have a chill from a fever. It’s an especially helpful relief if you have an upset stomach. 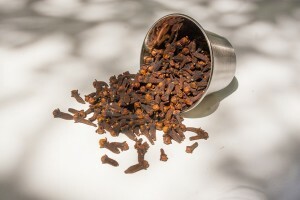 2) Clove Tea – An expectorant that makes it easier to cough up congestion in your lungs, a tea made with cloves can also encourage sinuses to open up so you can breathe easier and settle down an upset stomach. 3) Licorice Tea – With a delicious sweet flavor without the sugar, licorice supports your immune system while reducing soreness in your throat. Another fantastic herb for calming spasms in your lungs while thinning mucus so it’s easier for your cough to be productive instead of dry and irritating. Clove, licorice, and a host of other scrumptious-tasting and strengthening herbs can be found in our Liver Cleanse tea. What does the liver have to do with Immune health? Have you noticed that people tend to get sick if they have overeaten, and especially filled up on sugary things, or heavy foods that are hard to digest? As an added plus, your liver breaks down the excess of certain hormones – including cortisol, the stress hormone. So gentle liver support calming you down from stress that might push you over the edge into illness also helps. 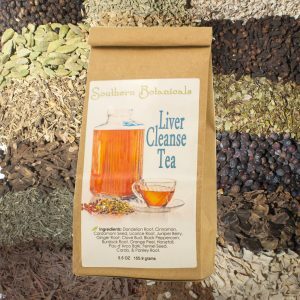 Get Liver Cleanse Tea or find out more about it. 4) Peppermint Tea – Contains menthol which helps break up congestion along with having a calming and numbing effect. 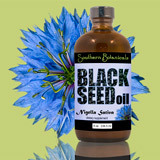 A helpful natural remedy when you have symptoms like a headache, nausea and congested sinuses. 5) Yarrow Tea – Relaxes you while offering great immune system support. 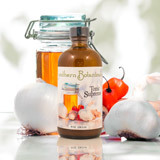 This classic herbal remedy for colds and flu encourages your body to sweat which can help naturally reduce a fever. Not all herbal teas are created equal. Oftentimes when you buy herbal tea bags at the store, the herbs have been dried and powdered beyond recognition and have less of the beneficial properties of the original plant. 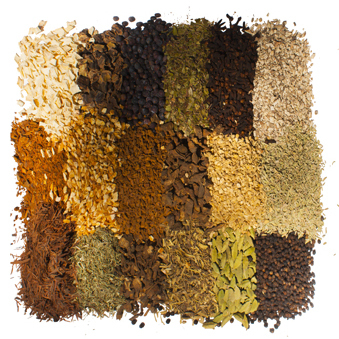 You know that cooking with whole foods retains more of their nutrients, and the same is true for herbal tea. Have you ever made tea with whole berries, chunks of roots and pieces of leaves? The difference in taste and effect may amaze you! To me, when you get an herbal tea with ingredients like clove buds in it, you should be able to see whole clove buds in the tea blend, not powdered cloves. These herbs can also be great aromatherapy when you lean over the pot of simmering tea and inhale the steam. The essential oils from cloves, ginger or peppermint billow into the air when you simmer those herbs, which also helps activate your immune system and clear congestion as you gently breathe in the steam. It’s easy to make a whole day’s worth of tea at once using bulk dry herb tea, so you can drink a hot cup in the morning, and take the rest with you in your water bottle to drink all day. Place 1-3 TBSP herbs in a pot with water and let soak for a time. You can put the herbs straight in the water and just pour off the tea when done, or tie the herbs in a small muslin cotton bag to remove later, or you can use a strainer after simmering. Bring 1 pint to 1 quart of water to a simmer. How much water you use here in ratio to your tea determines the potency of your tea. One Tablespoon to a pint is mild but still potent. Same for 2 Tablespoons herbs to a quart of water. 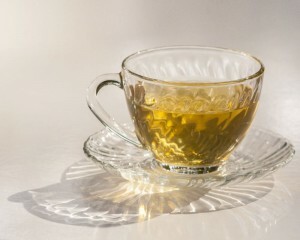 A very strong potent tea is made with 3 Tablespoons herbs to a quart of water. For lighter leaves like GingerMint Tea, turn off as soon as it comes to a simmer and let steep for 10 minutes or so. For a chunkier tea with many berries and roots like Liver Cleanse Tea, simmer on low for about 10 – 15 minutes, then turn off the heat and steep while cooling. Pour warm tea into your favorite tea cup or mug, breathe in the wonderful aroma and enjoy! Then you can let the rest sit and steep in the pot and drink at home throughout the day. Or, when cooled off enough, pour the rest into a glass water bottle to take with you and drink throughout the day for comfort and soothing great taste. Hot herbal tea can help you breathe easier, relax and make any symptoms more manageable. Continuing to drink whole medicinal teas for a day or longer can help clear your system of congestion and irritating toxins, and build up your strength. Taking a whole herbal tea regularly along with other herbs and healthy foods can help you build your immune fortress. 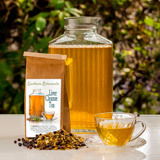 See our whole line Herbal Medicinal Teas for more excellent herbal support for your body systems. 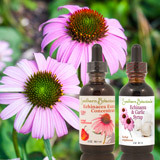 You can also check out our other Immune Support items or specifically our Echinacea products. Liver Cleanse Tea - 5.5 oz.